Who does not want to flaunt a beautiful home? As the saying goes, a done-up home is the owner’s pride and the neighbor’s envy. Though often the home owners pay less attention in the gate, one needs to realize that the fence and the gate are the first things that catches one’s eyes. In addition, this is that part of the house which helps to create the first impression of the residence. Thanks to the technological advancement there are various options for Automatic fence gate that one can decide from. These gates are not only aesthetically beautiful but also technologically advanced. If you want to give your residence a fresh look and planning to opt for automatic fence gate there are specific things that you should consider. 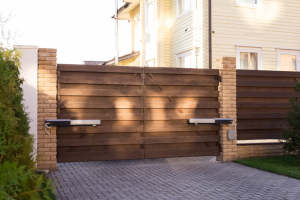 Here are 5 things to keep in mind when looking for the perfect Automatic Fence gate. When one is talking about home improvement then the sky is the limit. It is important to know what the options available in the market are and which one would actually fit their requirement of Automatic fence gate so that they can make the best choice. The first factor that you need to keep a tab on is what kind of driveway you have and the ground level in the area. Generally, there are two common kinds of gates to choose from- Slide Gates and Swing Gates. Slide Gates: No matter what kind of landscape or ground you have the Slides gates suit them perfectly. When one opens the gates, it opens from the middle and then can be slid on the left or right making way for the car to enter. Swinging Gates: Another example of Automatic Fence gate is the swinging gates. These gates are affixed on the sides of the driveway with hinges. However, it is advisable that one should opt for this gate only if there is adequate space inside the driveway or outwards on the streets. This is because these gates are known to open inwards into your driveway. Swinging gates are available in the form of single gate and double gate. Now since we are talking about Automatic Fence gates, it is important to know the kind of technology that is used in these gates. The whole objective of installing these automatic gates is that one does not need to manually open and close the door. Rather, they can control the same with technology. Keypad Entry: Keypad entry is the most common kind. In this case, the gates are preprogramed in such a manner that when you are home you can press the code on the keypad and the gate opens automatically. These gates also form a kind of protection for the property. The key gives one access to the gate, which ensures that anyone or everyone does not get access to the property. Card Based Entry: These are a form of advanced gates. In this case, one needs to simply swipe the entry card to open the gate. It saves one the trouble of remembering the security code. As long as one is carrying the entry card, they can swipe it and enter the property. Apart from these major things to keep in mind, another important aspect to consider is the material used in the gates. Mainly three kinds of materials are used like – wood, wrought iron, and plastic. Depending on the weather, kind of terrain and design of the house you can make a pick. If you are thinking of home improvement or enhancing your fence, then the automatic fence gate is the best option to protect your property. The above points will help you to make the best choice.